ANN ARBOR — Cesar Ruiz had only gone against him one or two times in practice, but he could recall the reps vividly. They were preceded with a load yell and plenty of force, two characteristics of an eager Ben Mason. The junior from Newton, Conn., enters his third season on the Michigan football team with his plate more full than ever before. Not only is he taking reps as needed at fullback, but the 6-foot-3, 254-pound Mason is also working at tight end and at defensive tackle. Don’t forget about special teams, too, making him a true all-around player this spring for the Wolverines. Mason rushed for 80 yards and seven TDs as a fullback in 2018. Folks who hang around Mason will just laugh it off. That’s how he is on the football field: eager, intense, and always willing to give 100 percent, no matter the situation or circumstance. Which is why he obliged when head coach Jim Harbaugh came to him early in winter workouts about trying out on the defensive line. And just like when Harbaugh told him over and over during the recruiting process that he’d make a good fullback, Mason knew a potential switch was coming. Mason says he switches positions every period of every practice. He’ll rotate each practice by which individual drills he starts with, then go where he’s most needed. On some days, that’s on the offensive side of the ball. The Wolverines are currently depleted in experienced ball carriers, and are working to integrate the tight ends into a new-look, more-up tempo offense under new coordinator Josh Gattis. Some days, he focuses on defense. The Wolverines will host an open-to-the-public practice at 2:15 p.m. Saturday at Michigan Stadium. Brown says Mason comes off the ball exceptionally well and would be able to handle playing at the three-technique, lining up on the outside shoulder of a guard with the goal of disrupting in the backfield. Currently, Carlo Kemp and Donovan Jeter are taking reps as the No. 1 defensive tackles, with true freshman Mazi Smith backing up Jeter and Mason in the rotation too, Harbaugh said this week. 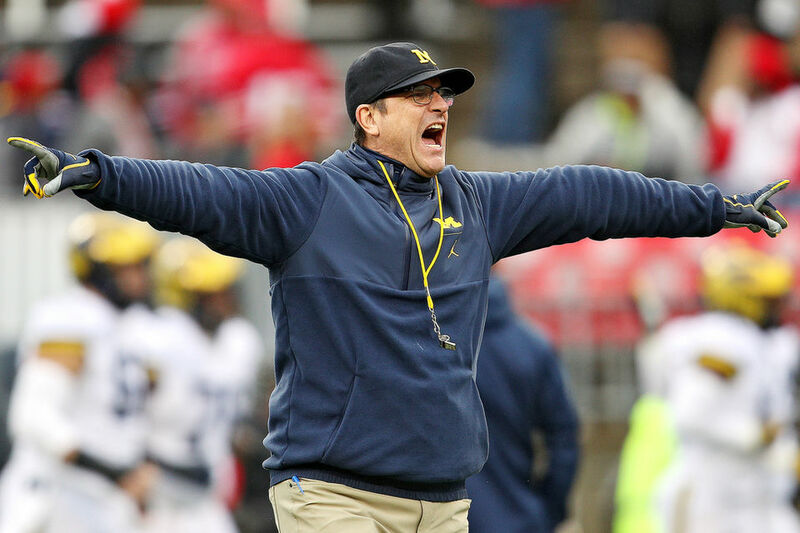 “I think he’s going to handle it pretty well,” Harbaugh said in March, at the start of spring practice. “Even last year’s offense, he would have been playing somewhere around 20-25 plays a game. We’d like to see Ben Mason getting 60 plays a game. 70 plays a game. Michigan’s new offense appears to fading out the fullback position, the one Mason saw most of his playing time at in 2017 and 2018, making the defensive line his best chance at getting additional playing time in. Which is fine with him. Mason will be gladly admit that he’s a football-first guy, and his loyalty lies with the coaching staff and the team. Teammate and fellow tight end Nick Eubanks likened Mason last week to Bobby Boucher, the fictitious character in “The Waterboy” who went from football team water boy to knocking opponents out. “When I think defensive-minded, I think attacking,” Mason said. “I think smothering and wanting to go after people. I could see myself as a defensive-minded player, but I think I’m an offensive-minded football player too.